Team Nigeria has emerged winners of the female category and also retained their crown as continental champions at the African Wrestling Championship. Nigeria finished tops with 195 points, hosts Tunisia was second with 177 points, Egypt came third with 160 points, Algeria recorded 83 points to finish fourth while Senegal completed the top five with 57 points. 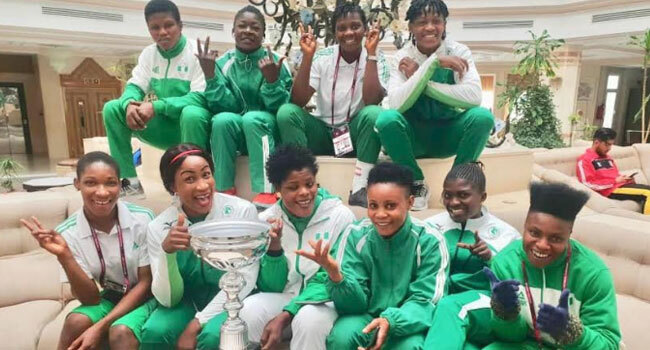 Nigeria registered ten female wrestlers for the championship but only nine got busy on the mat and produced 5 gold, 2 silver and 2 bronze medals. Esther Kolawole couldn’t compete in the women’s 55kg category after hurting her knee in training. Mercy Genesis defeated her Algerian opponent to win the country’s first gold medal at the championship. The victory ensured Genesis maintains her superiority in the 48kg category, retaining the title she won last year. Odunayo Adekuoroye showed class in the women’s 57kg to win the second gold beating Essone Tiako of Cameroon by pinfall. The victory also gave Adekuoroye the Outstanding Wrestler of the Tournament Award. The gold rush continued with a new discovery, Sunmisola Balogun beating Yvette Zie of Burkina Faso in the women’s 65kg category. In the 68kg final bout, Blessing Oborududu produced a fine performance as she beats Senegal’s Anta Sambo 10-0 to win Nigeria’s 4th gold medal. 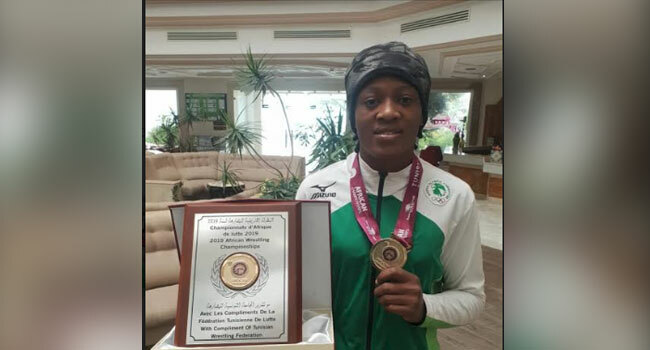 Blessing Onyebuchi wrapped up the fine performance when she outclassed Ayari Rehim of Tunisia to win Nigeria’s fifth gold medal. Commonwealth gold medallist, Aminat Adeniyi (62kg) and Hannah Reuben (72kg) won silver medals from their events while Rosemary Nweke (53kg) and Ifeoma Nwoye (59kg) settled for bronze. At the last edition in Port Harcourt, Nigeria dominated the women’s category, featuring ten wrestlers and won 9 gold and 1 silver medal.